The dreaded morning after the debate. Today is the day that the media puts its own spin on how the current Vice President and potential Vice President fared. Words such as “feisty”, “fiery”, and “sparks fly” will be used. If you were a web editor, which headline do you think would generate more clicks? How/why has Joe Biden been in politics so long? He kept referring to his track record, to historical events he was actually present to vote for. All I could think was that he is a part of the cause and a major part of the problem our nation faces today. When the Vice President wasn’t acting like a child by making faces, interrupting, and generally being rude, he took on the tone that was demeaning. I didn’t appreciate his demeanor. On the other hand, we had Congressman Paul Ryan. 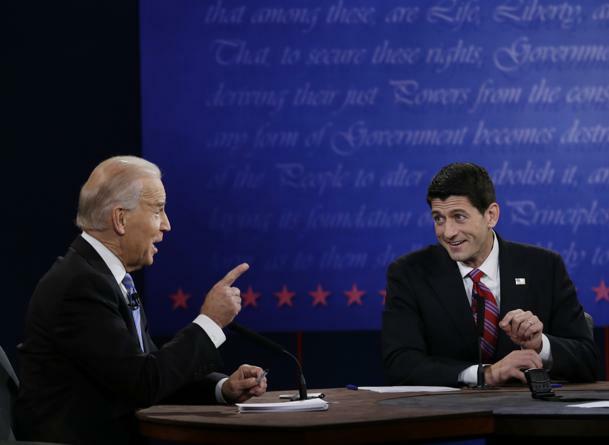 Ryan would often answer questions and then point blank dodge others. At times all he needed to do was answer a question with a simple one sentence answer. That was all I needed to hear. I did like how he would sit patiently and wait his turn. Ryan came across as civil. We need more civility in politics. I do wish though that he had kept his answers shorter and more concise. The moderator, Martha Raddatz, was a breath of fresh air. She asked thoughtful questions that demanded thoughtful answers. Very rarely though did I feel that either candidate answered her questions well. Disappointing. The countdown to the election draws nearer. Are you going to vote?